A Report on Road Accidents in India 2016, published by Transport Research wing under Ministry of Road Transport & Highways, Government of India, has revealed that more people died on roads accidents in India last year, as compared to the number of deaths in 2015. The data has further revealed that the states of Uttar Pradesh and Tamil Nadu have accounted for maximum number of deaths this year. As per the data cited in the report, the country recorded at least 4,80,652 accidents in 2016, leading to 1,50,785 deaths. The number suggests that at least 413 people died everyday in 1,317 road accidents. Further breaking down the statistics, the data reveals that at least 17 deaths occurred in road accidents in 55 accidents every hour in the given time period. Comparing the new recordings with data from previous year shows that in spite of recording fewer accidents in 2016, more deaths have occurred this year as in 2015. In 2015, 1,46,133 people had died in 5,01,423 accidents. The accident severity, which is measured as the number of persons killed per 100 accidents, was recorded at 29.1 in 2015 which is lower than 31.4 in 2016. Click here to see enlarged image of the graph. The report further revealed that Highways are not the “biggest killers”. As per the report, 34.5 per cent accident deaths occurred on National Highways, while 27.9 per cent accident deaths took place on State Highways, while maximum percentage of deaths occurred on other roads (37.6). Giving insight into the cause of accidents, it further added, that speeding appears to the be the biggest cause of concern, other than usage of mobile phones while driving vehicles. While speeding led to 66.5 per cent of all road accidents and 61 per cent of deaths, usage of cellular phones caused just below 5000 accidents and over 2000 deaths. 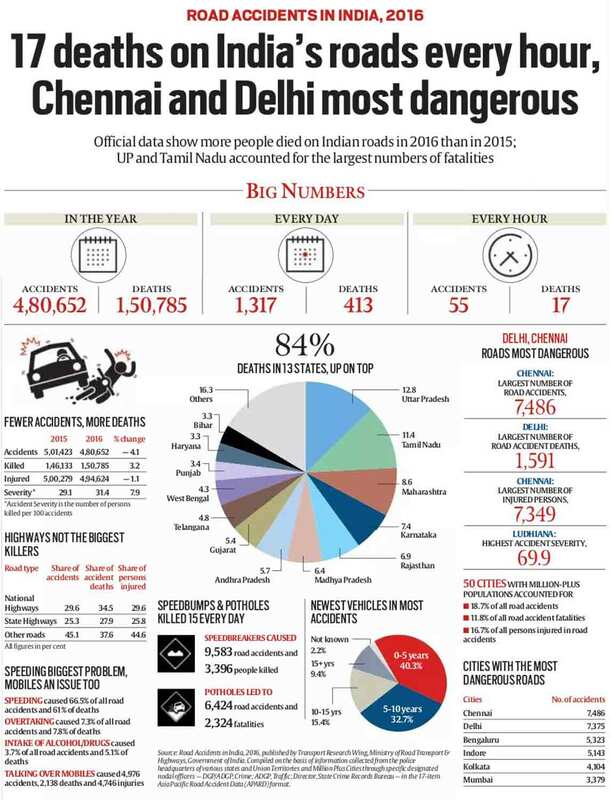 The study went on to list Chennai as the city with most dangerous roads, as it recorded 7,486 accidents in 2016, followed by Delhi which recorded 7,375 accidents. Bengaluru, Indore and Kolkata, rounded up the top five positions in the list, respectively. With 12.8 per cent of total road accidents, the state of Uttar Pradesh saw the highest road accidents, followed by Tamil Nadu (11.4), Maharashtra (8.6) and Karnataka (7.4). An interesting discovery of the report was the fact that cities with a large population saw majority of accidents. The report said that 50 cities with million-plus populations accounted for 18.7 per cent of all road accidents and 11.8 per cent of all accidents deaths. The report also found that newest vehicles featured in most of the accidents. Vehicles with usage age of 0-5 years featured in 40.3 per cent of the accidents, while those of 5-10 usage years featured in 32.7 per cent of accidents. In terms of deaths caused by speed bumps and potholes, the report said that just below 10,000 road accidents were caused by speed breakers, which led to death of 3,396 people. The potholes were held responsible for at least 6,424 road accidents out of which 2,324 proved to be fatal, the report said.